Object recognition is central to perception and cognition. Yet relatively little is known about the environmental factors that cause invariant object recognition to emerge in the newborn brain. Is this ability a hardwired property of vision? Or does the development of invariant object recognition require experience with a particular kind of visual environment? 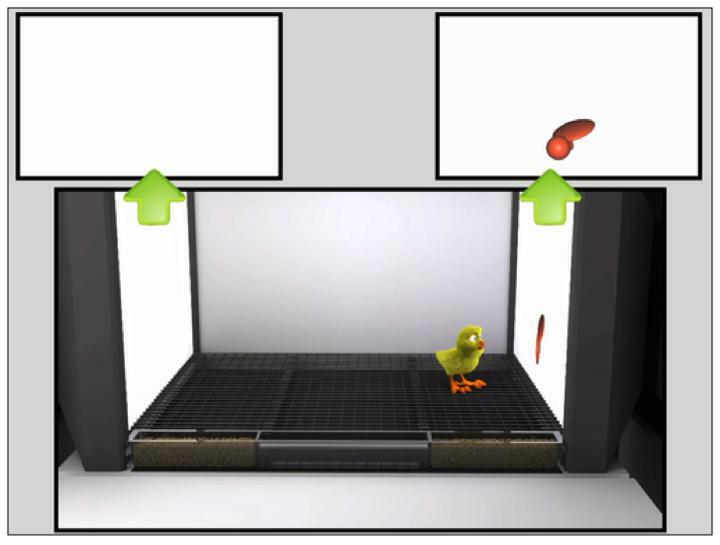 Here, we used a high-throughput controlled-rearing method to examine whether newborn chicks (Gallus gallus) require visual experience with slowly changing objects to develop invariant object recognition abilities. When newborn chicks were raised with a slowly rotating virtual object, the chicks built invariant object representations that generalized across novel viewpoints and rotation speeds. In contrast, when newborn chicks were raised with a virtual object that rotated more quickly, the chicks built viewpoint-specific object representations that failed to generalize to novel viewpoints and rotation speeds. Moreover, there was a direct relationship between the speed of the object and the amount of invariance in the chick’s object representation. Thus, visual experience with slowly changing objects plays a critical role in the development of invariant object recognition. 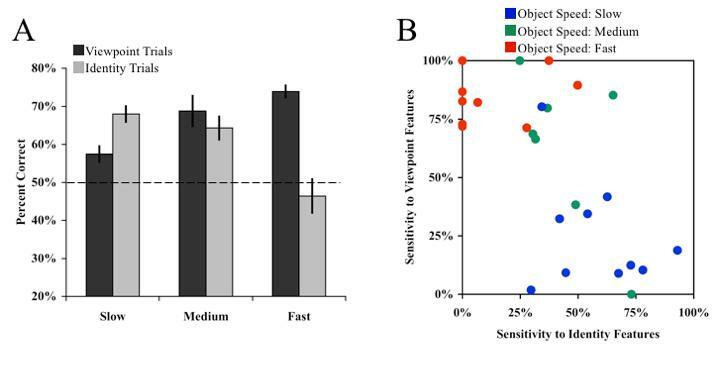 These results indicate that invariant object recognition is not a hardwired property of vision, but is learned rapidly when newborns encounter a slowly changing visual world. Illustration of a controlled-rearing chamber. Newborn chicks were raised in strictly controlled environments devoid of real-world objects. To present object stimuli to the chicks, virtual objects were projected on two display walls situated on opposite sides of the chamber. During the input phase (first week of life), the chicks were exposed to a single virtual object that rotated continuously, completing a full rotation every 1 (fast speed), 5 (medium speed) or 15 s (slow speed). Results from experiment 1. (A) The chicks’ object recognition performance when raised with a slow, medium or fast object. The graph shows the percentage of time the chicks spent with the correct animation (i.e. the familiar object on the identity trials and the familiar viewpoint range on the viewpoint trials). When exposed to a slowly rotating object, the chicks built invariant representations that were selective for object identity and tolerant to changes in viewpoint. In contrast, when exposed to a quickly rotating object, the chicks built viewpoint-specific representations that were selective for familiar viewpoints with little to no sensitivity for object identity features. (B) The abstraction space for visualizing the pattern of variation across subjects. Each dot depicts the object representation built by a single chick. The x-axis reflects the representation’s sensitivity to identity features and the y-axis reflects the representation’s sensitivity to viewpoint features. The position of the representation in the abstraction space was largely determined by the object’s rotation speed. Results from experiment 2. (a) The chicks’ object recognition performance when raised with a slow, medium or fast object. The graphs show the percentage of time the chicks spent with the correct animation for each test trial type. 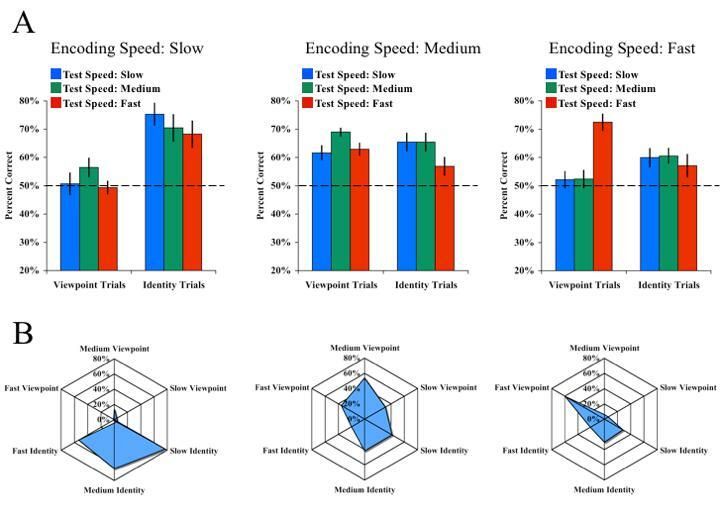 (b) Radar graphs illustrate the different types of object representations built by the chicks exposed to the slow, medium and fast objects during the input phase. The information content of the representation was largely determined by the object’s rotation speed when the object was encoded into memory. When exposed to a slowly rotating object, the chicks built invariant representations that were selective for object identity, regardless of whether the test objects rotated at slow, medium or fast speeds. In contrast, when exposed to a quickly rotating object, the chicks built viewpoint-specific representations that were selective for familiar spatiotemporal features.